All funds raised through this delish Homefront IPA will be donated to a military-focused charitable organization. We salute the fine folks over at Crown. For the second straight year, Crown Beverage Packaging North America will help to make Memorial Day memorable in support of U.S. military armed services, veterans and their families. 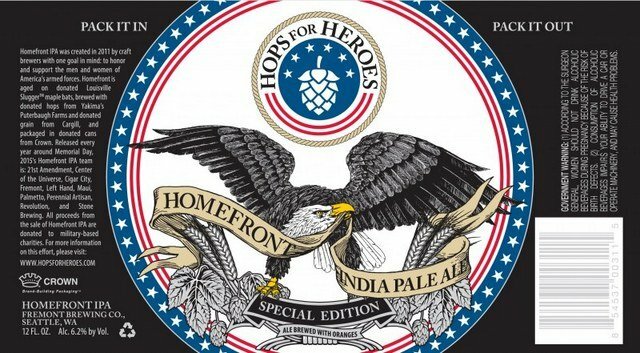 The company will be a national sponsor of Hops for Heroes’ 2015 Homefront IPA program and will donate cans, graphics work for can printing and freight for shipping, so that the 10 participating craft breweries can produce their own unique versions of Homefront IPA for mutual release parties, events and local accounts. Notably, all funds raised will be donated to a military-focused charitable organization. This year’s charity is Soldiers’ Angels, which provides aid and comfort to men and women of the U.S. Army, Marines, Navy, Air Force and Coast Guard. In 2014, over $200,000 was raised in the Homefront IPA effort. To remind customers of the importance of the past, present and future members of our armed services, Memorial Day (May 25th for your knuckleheads who don’t know) will be the official release date of Homefront IPA. It will also encourage customers to remember the ultimate sacrifice so many have made to preserve our freedom. Crown will partner with ten craft breweries, so they can each package and promote their own versions of Homefront IPA. The 2015 participants include: Center of the Universe Brewing Co. (Ashland, Va.), Fremont Brewing Co. (Seattle, Wash.), Cigar City Brewing (Tampa), Perennial Artisan Ales (St. Louis), 21st Amendment Brewery (San Francisco), Left Hand Brewing Co. (Longmont, Colo.), Stone Brewing Co. (Escondido, Calif.), Palmetto Brewing Co. (Charleston, S.C.), Maui Brewing Co. (Lahaina, Hawaii) and Revolution Brewing (Chicago). Hops for Heroes was created in 2011 by craft breweries from across the country that wanted to team up and support our men and women of the armed forces. The effort led to Homefront IPA, a beer aged on Louisville Slugger maple bats.